Hello there! 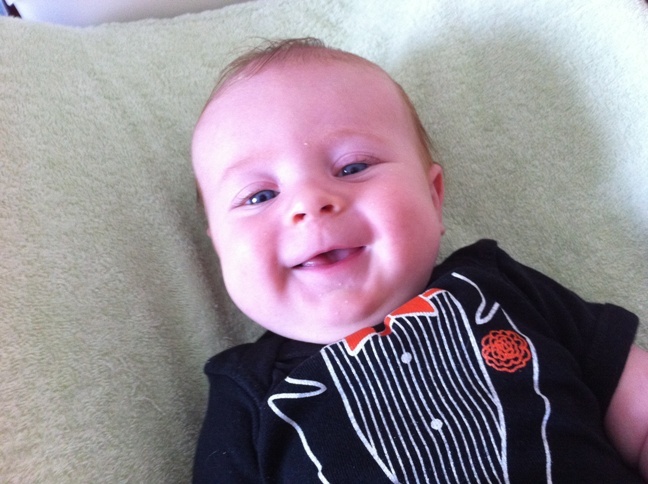 It’s been another month since I blogged last and Jack is now 10 weeks old. This week is my last week of maternity leave and then I start back to work full time. I’m anxious about leaving Jack at day care but part of me is looking forward to getting back to work. So the heat this summer has been RIDICULOUS. It’s been too hot to do anything except sit in air conditioning and eat mass quantities of ice cream. 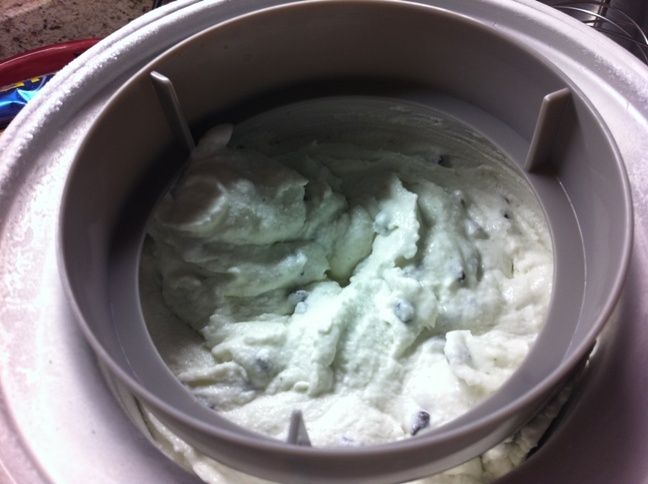 I busted out my ice cream maker a week or two ago when my friend tweeted a link to this super simple 3 ingredient chocolate ice cream recipe. I’ll post about that later when I make it again and remember to take pictures. After making that first batch I got all excited about homemade ice cream again and started googling recipes. I used 2 cans of coconut milk, which was slightly less than the 4 cups called for in the recipe. I also used 1 cup of granulated sugar as the sweetener. For the chocolate chips I used miniature milk chocolate chips. I did include the dried parsley, but it didn’t really add much green coloring. More like some green flecks. It did not affect the taste at all. I blended everything accept the chocolate chips in my Vita-Mix. As the author of the recipes said, a high speed blender is essential if you are using granulated sugar. The blender will dissolve the sugar into the mixture. A regular blender or mixer will not do this, so you’ll want to heat the sugar on the stove in the coconut milk to dissolve the granules. Otherwise you’ll have grainy ice cream. If you use a liquid sweetener such as agave, maple syrup or stevia, you can just whisk it together in a bowl. After blending, I stuck the entire blender carafe in the refrigerator to chill for an hour or so. Then when I was ready to freeze it, I blended it again for a few seconds and then poured the mixture right into the ice cream maker. It took a good 30 minutes to get to the consistency I wanted. Then I added the chocolate chips and let it run for a few more minutes and then transfered the mixture to a plastic container, which went into the freezer to harden. A couple of hours later it was still pretty soft, but Benzo and I ate some anyway. The taste was PERFECT! It was so creamy and delicious and I could not taste the coconut at all. Benzo and I both loved it. Let me say that I LOVE this recipe. First of all, it was so easy, especially when using the Vita-Mix. Toss all ingredients in the blender and then freeze. I probably didn’t even have to chill it first. Some ice cream recipes require you to cook some concoction on the stove and then cool the entire mixture and then freeze. The process takes forever! Second, I am in love with using coconut milk to make ice cream. Yeah it makes the ice cream super creamy and it’s dairy-free, which are both good reasons. But if I’m being honest, here’s the real reason I love coconut milk: coconut milk comes in a can. Cans are kept in the pantry. Which means that all the ingredients for this recipe are pantry items. Which means I can keep the ingredients on hand at all times to make ice cream whenever the mood strikes. Too often I want to make ice cream but it requires going to the store to get the ingredients. Or I decide to make ice cream so I buy the ingredients on my weekly shopping trip and then I never get around to it and the cream spoils and goes to waste. With coconut milk these are non-issues! P.S. Here is a picture of Jack just for fun. He smiles all the time now but whenever I whip out the camera he stops. So this is one of the few I’ve caught in a picture! I think he looks like you. I always love seeing your blog in my Feedler… Thanks for sharing. 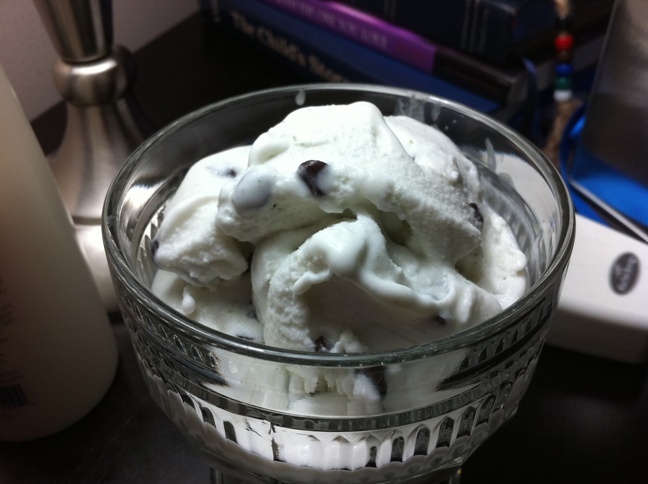 Yummy – ice cream and Jack!